Just the thing to eat when you want a treat and... err. There are no cookies in the house anymore. These are soft, chewy, and wonderful, without being cakey. And so yummy. Blend cashews in a food processor as long as you can stand. The smoother they are, the better the cookies. Transfer to a bowl and mix in eggs and honey. Batter will be soupy/gloppy. A little time in the fridge helps. 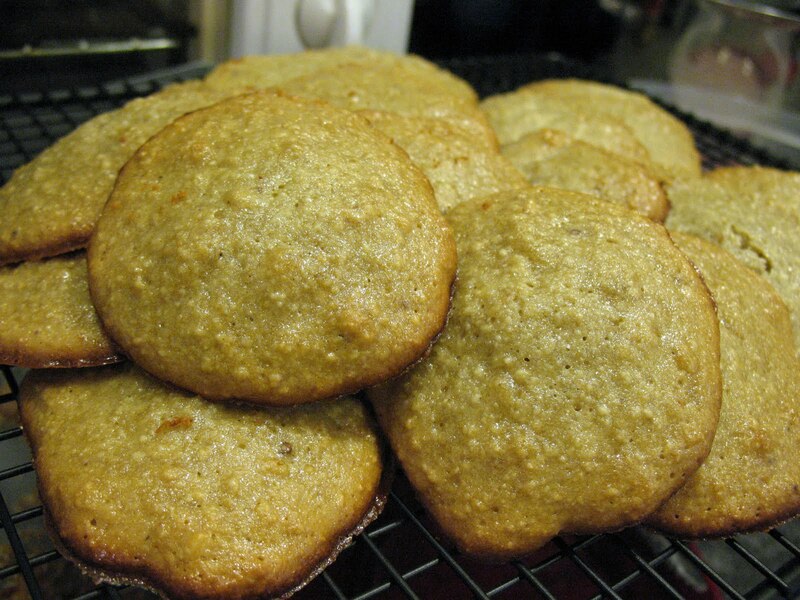 Drop in gloppy spoonfuls onto greased cookie sheet and bake at 350º for 10-12 minutes. They will spread, fluff up, and finally turn golden brown. Allow to cool on the pan before transfering to a cooling rack. Or your mouth. Makes 2 dozen large cookies, or 3 dozen smaller ones. Notes: I could easily see this working with 1 egg per two cups cashews. You could also use less honey if you like since cashews are naturally sweet. I was sent here today from the Health Home and Happiness blog. I can not wait to try this recipe along with the cauliflower popcorn!! Thanks for such great ideas. Jen -- where do you get your nuts? I'm in need of a source for cashews and others. Looking forward to trying this yummy recipe! I've been getting nuts through the food co-op my mom is in. Cashews are never going to be raw, because it requires heat to remove them from the shell, and I'm not 100% sure that the other nuts are only steamed, but they seem pretty good and the prices are great. Go to clnf.org for their catalog and more info. Sara brought us Walnut cookies from this recipe... they were delicious and I will definitely make these!